Recently, Gravitate received a letter from a young woman named Lindsey, an eighth grader from Wisconsin in the process of conducting some career research. She was looking to Gravitate for general web design knowledge along with some advice on pursuing a career in the creative industry. We believe it’s vital to our industry to selflessly contribute to the web design community—to foster the growth of new ideas and support each new generation of designers, developers, writers, strategists, and SEO specialists. This is why we jump at as many opportunities as possible to give back to the web design community to help inspire people to work in our industry. 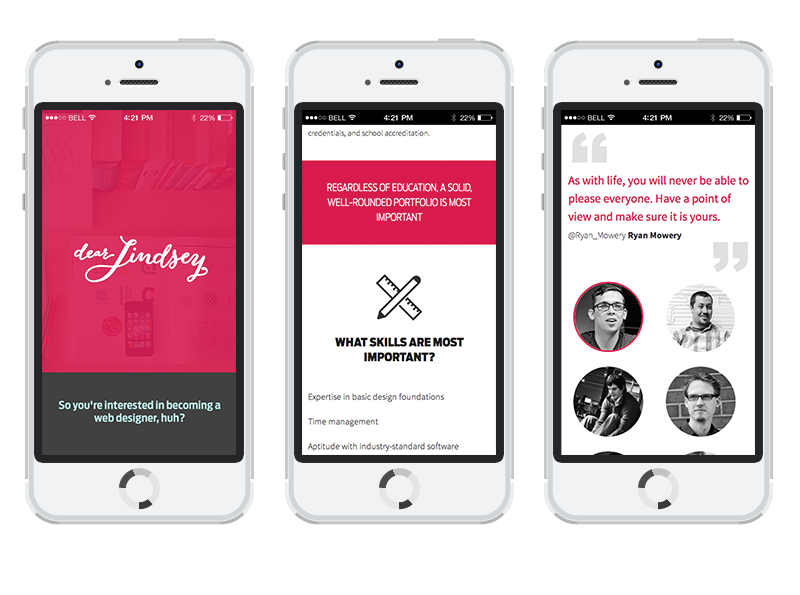 We built Dear Lindsey, an educational microsite, for her and anyone else curious about working in the field. Technically, the site is fully responsive and utilizes the bulk of our company’s core services and competencies. Many people from a variety of disciplines helped brainstorm, strategize, and execute the project—all on their own time. And at the end of the day, it’s a successful and good-looking site. We built a fun and educational microsite; so what? Technology rapidly changes every day—especially on the internet. The tech industry is full of extremely forward-thinking people, constantly pushing for innovation and reimagining and shifting old paradigms. Our industry tends to embrace new ideas with an open spirit. Given that it is 2014, and the tech industry is on the cutting edge of humanity, we shouldn’t still be seeing this gender gap. It is up to us to do something about it, or a shift will never take place.